Please note: this checklist includes only general considerations. It is important to be aware of any specific processes that are run for your state. You may want to access our online documentation for Financial Management, Account Management, Year End, and Fiscal Year End Processes to reference additional items to consider in preparation for year end and state-specific items. Run a list of open purchase orders you intend to roll forward, and verify the Reserve for Encumbrance balance equals the balance of the remaining encumbrance of the PO. Run the Encumbrance Carry Forward or Expense Open Purchase Order processes. The encumbrance carry forward process will roll any remaining encumbrances into the new fiscal year. For the Encumbrance Carry Forward Process, if the amount is included in the budget, it will be reflected in the revised budget and may be reported with the Budget Carry Forward field. The expense open PO process will charge any remaining encumbrances in the old year and roll the purchase order into a new year with (typically) a liability account. Verify that all open invoices are outstanding. 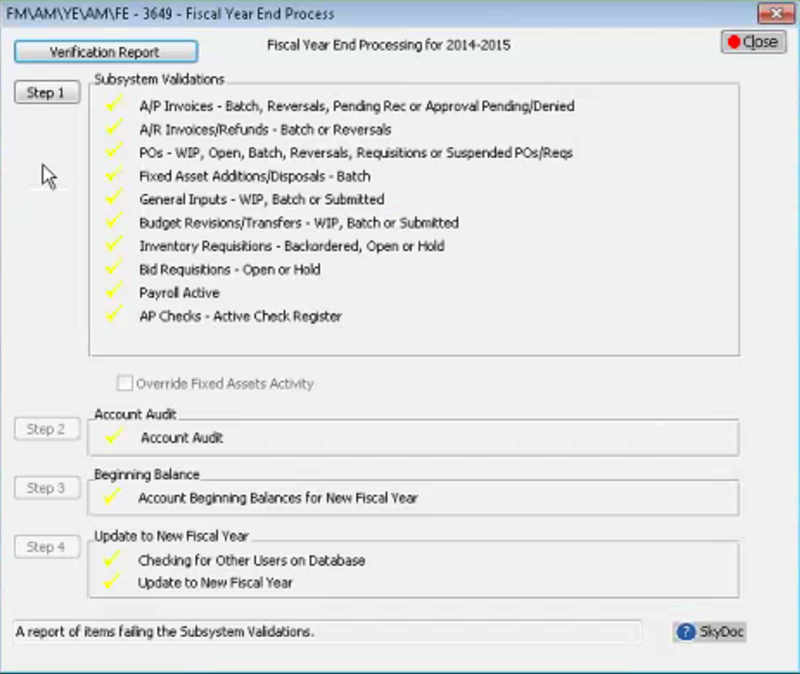 Run the Open Invoice History Report using the last day of the fiscal year as the report date. Verify that the balance in the Accounts Payable Accrual Liability reconciles the open invoice amount. Run and review the following from FM\AM\AU\DI\AI: Master/Detail Invoice Activity Audit, Fix AP History Invoices Audit, Credit Card Activity, Check Requests, and Expense Reimbursement. Verify all check runs have been completed and posted for the closing year. Verify all entries for the fiscal year have been recorded, including entries that may be done annually or infrequently. Reconcile all bank statements, cash accounts, payroll liability accounts, Accounts Payable liability accounts, and inter-fund accounts through the last month of the fiscal year. Verify all entries for the fiscal year have been recorded, including entries that may be done annually or infrequently. Reconcile all bank statements, cash accounts, payroll liability accounts, Accounts Payable liability accounts, and inter-fund accounts through the last month of the fiscal year. Verify payroll processes are complete, including payroll runs, retirement system processes, and on-behalf expense batch journal entries, as necessary. Post Payroll Accruals as appropriate. If you post monthly accruals or use the payroll encumbrance process, reverse all accruals or liquidate all encumbrances. 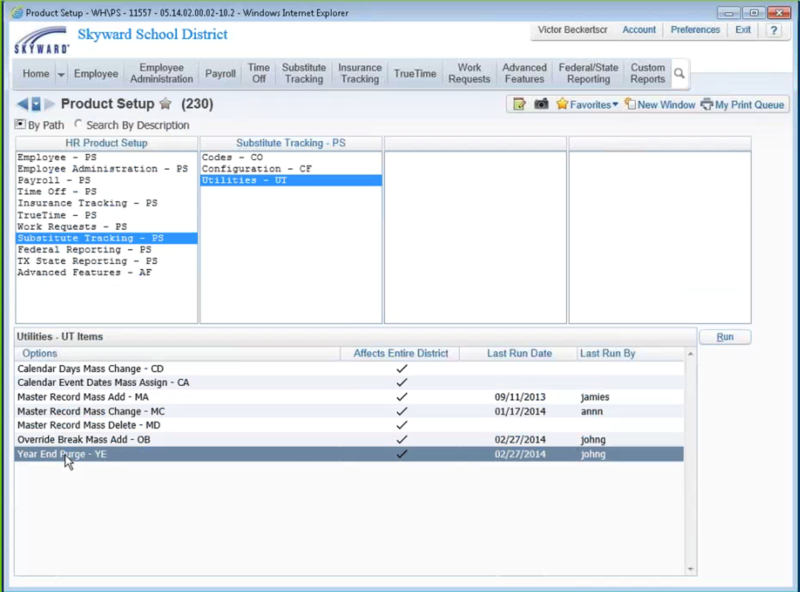 Reverse any prior month salary accruals in the system or liquidate any prior Payroll Encumbrance processes. Process Payroll Payables in accordance with your fiscal year start (July or September). Refer to our online documentation for further details on either closing the year in Employee Management or starting the New Year in Salary Negotiations. The module used is typically dictated based on your state residence. Allocate time off for the new fiscal year. 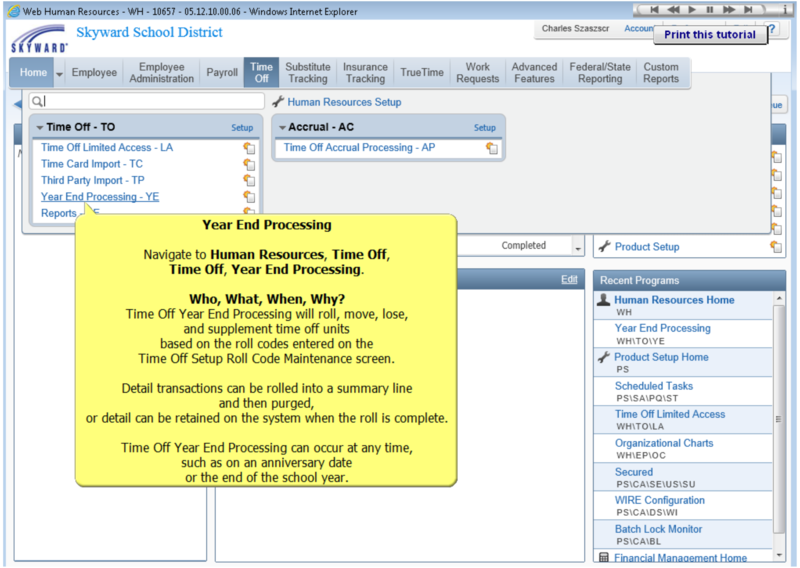 Allocation amounts are determined by the setup on an employee’s time off code. Be sure to check whether your state has any additional items to consider. Verify that all cash receipts have been entered and updated in the system. Verify that all Estimates and/or Billings have been run and updated in the system. Run the Insurance Tracking Roll process if necessary. We hope these checklists will help you simplify your year-end processing. You can also check out SkyDoc for detailed documentation about each of these procedures. If you need further assistance, reach out to us. We are always just a phone call (or a click) away.